The amount of toxic C9 aromatic hydrocarbon leaked into the sea in East China’s Fujian province was 10 times higher than the amount originally reported, the Quanzhou municipal government said at a press conference Sunday. The city government’s investigation found that an aging pipe at a Quangang district terminal broke when C9 aromatic hydrocarbon, a substance used as a solvent in paint and rubber products, was being transferred to a tanker just after midnight on Nov. 4, resulting in 69.1 metric tons of the chemical leaking into the sea. Fujian Donggang Petrochemical, the owner of the terminal, had originally reported that only 6.97 metric tons had been leaked. Donggang Petrochemical intentionally underreported the amount of C9 leaked, the investigation found, and neglected to report 32.4 tons of chemical in the broken pipe that also leaked into the sea. Another 29.7 tons were found to have leaked from two other storage tanks that Donggang did not initially report it had filled. 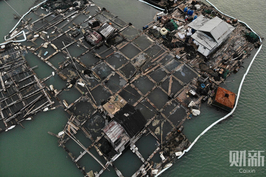 In the aftermath of the spill, villagers reliant on fish farming complained of a strong-smelling yellow oil that corroded their fishing equipment and killed their fish. 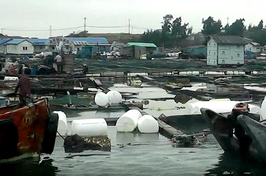 Fishermen told Caixin that they had not been warned that the chemical was toxic. Villagers did not believe local government officials’ declaration that the water and air quality in the area were back to safe levels after cleanup efforts. After the spill, many villagers complained that the government had not done enough to handle the incident. More than 50 people were sent to the local Quangang hospital due to exposure to the chemical, which can cause vomiting, nausea and cramping. 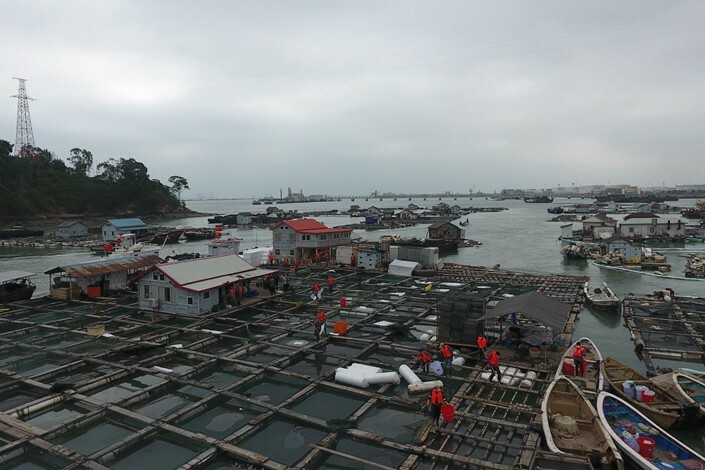 Many of them had been exposed while working to save their fish farms, Caixin learned. 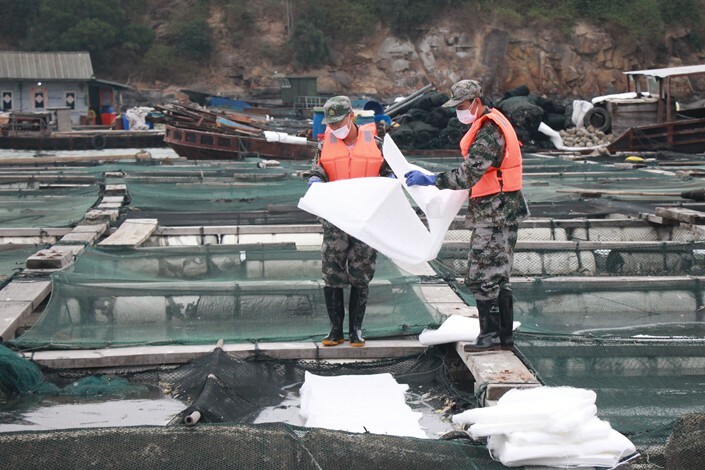 The local agriculture authority issued a warning on Nov. 5 suspending sales and use of aquaculture products from the water, and Caixin learned that villagers have stopped feeding the fish that initially survived the spill. 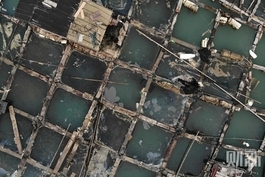 Much of locals’ plastic fishing equipment has been corroded — photos provided to Caixin after the spill showed fishing rafts with plastic undersides that appeared to have partially dissolved. About 10 days after the leak, police in Quanzhou arrested seven people for negligence, including three employees of Donggang Petrochemical and four workers on the chemical tanker. However, residents told Caixin that while this chemical spill has been particularly disastrous, ships going to and from the petrochemical terminal have been leaking small amounts of oil and other chemicals for the past few years. 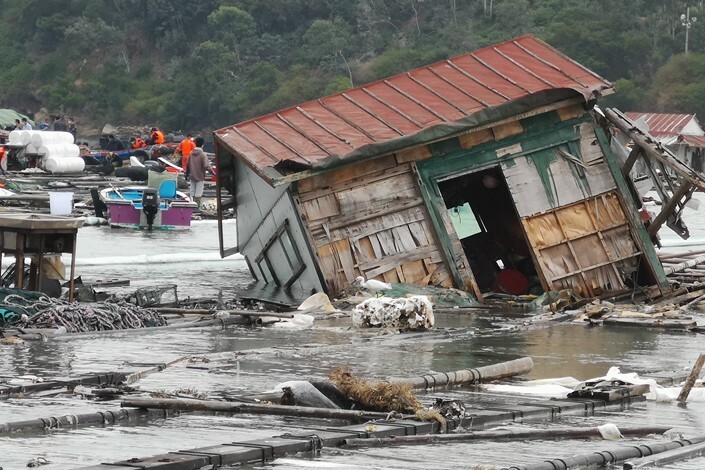 Many villagers have stopped fishing in the area or have been relocated. The government concluded that Donggang Petrochemical holds major responsibility for the chemical spill, but added that Quangang district did not take adequate steps to clean up and notify residents. 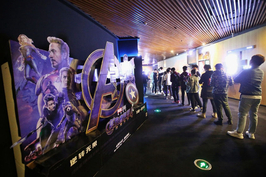 The report said that the city government would provide 5 million yuan ($719,500) in aid to support families whose fishing stock and equipment were affected. The government said that it would hire professionals to continue to monitor the affected areas.